Medicare Hospital Insurance and Social Security would not add to deficits because they can’t spend money they don’t have. The dog days of August have given way to something much worse. Congress returned to session this week, and the rest of the year promises to be nightmarish. The House and Senate passed budget resolutions earlier this year calling for nearly $5 trillion in spending cuts by 2025. More than two-thirds of those cuts would come from programs that help people with low-and moderate-incomes. Health care spending would be halved. If such cuts are enacted, the president will likely veto them. At best, another partisan budget war will ensue after which the veto is sustained. At worst, the cuts become law. The putative justification for these cuts is that the nation faces insupportable increases in public debt because of expanding budget deficits. Even if the projections were valid, it would be prudent to enact some tax increases in order to preserve needed public spending. But the projections of explosively growing debt are not valid. They are fantasy. Wait! you say. The Congressional Budget Office has been telling us for years about the prospect of rising deficit and exploding debt. They repeated those warnings just two months ago. Private organizations of both the left and right agree with the CBO’s projections, in general if not in detail. How can any sane person deny that the nation faces a serious long-term budget deficit problem? The answer is simple: The CBO and private organizations use a convention in preparing their projections that is at odds with established policy and law. If, instead, projections are based on actual current law, as they claim to be, the specter of an increasing debt burden vanishes. What is that convention? Why is it wrong? Why did CBO adopt it, and why have others kept it? CBO’s budget projections cover the next 75 years. Its baseline projections claim to be based on current law and policy. (CBO also presents an ‘alternative scenario’ based on assumed changes in law and policy). Within that period, Social Security (OASDI) and Medicare Hospital Insurance (HI) expenditures are certain to exceed revenues earmarked to pay for them. Both are financed through trust funds. Both funds have sizeable reserves — government securities — that can be used to cover short falls for a while. But when those reserves are exhausted, expenditures cannot exceed current revenues. Trust fund financing means that neither Social Security nor Medicare Hospital Insurance can run deficits. Nor can they add to the public debt. Nonetheless, CBO and other organizations assume that Social Security and Medicare Hospital Insurance can and will spend money they don’t have and that current law bars them from spending. One of the reasons why trust fund financing was used, first for Social Security and then for Medicare Hospital Insurance, was to create a framework that disciplined Congress earmarked to earmark sufficient revenues to pay for benefits it might award. Successive presidents and Congresses, both Republican and Democratic, have repeatedly acted to prevent either program’s cumulative spending from exceeding cumulative revenues. In 1983, for example, faced with an impending trust fund shortfall, Congress cut benefits and raised taxes enough to turn prospective cash flow trust fund deficits into cash flow surpluses. And President Reagan signed the bill. In so doing, they have reaffirmed the discipline imposed by trust fund financing. Trust fund accounting explains why people now are worrying about the adequacy of funding for Social Security and Medicare. They recognize that the trust funds will be depleted in a couple of decades. They understand that between now and then Congress must either raise earmarked taxes or fashion benefit cuts. If it doesn’t raise taxes, benefits will be cut across the board. Either way, the deficits that CBO and other organizations have built into their budget projections will not materialize. 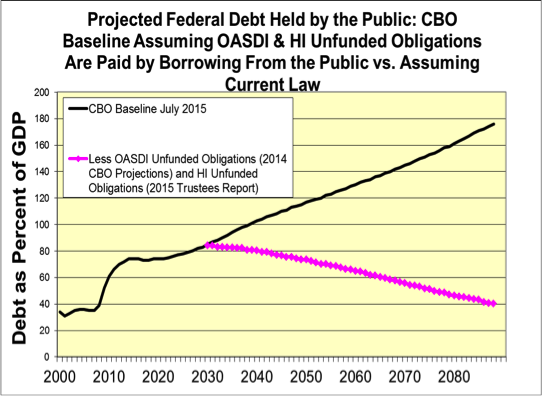 The implications for projected debt of CBO’s inclusion in its projections of deficits that current law and established policy do not allow are enormous, as the graph below shows. If one excludes deficits in Social Security and Medicare Hospital Insurance that cannot occur under current law and established policy, the ratio of national debt to gross domestic product will fall, not rise, as CBO budget projections indicate. In other words, the claim that drastic cuts in government spending are necessary to avoid calamitous budget deficits is bogus. It might seem puzzling that CBO, an agency known for is professionalism and scrupulous avoidance of political bias, would adopt a convention so at odds with law and policy. The answer is straightforward—Congress makes them do it. Section 257 of the Balanced Budget and Emergency Deficit Control Act of 1985 requires CBO to assume that the trust funds can spend money although legislation governing trust fund operations bars such expenditures. CBO is obeying the law. No similar explanation exonerates the statement of the Committee for a Responsible Federal Budget, which on August 25, 2015 cited, with approval, the conclusion that ‘debt continues to grow unsustainably,’ or that of the Bipartisan Policy Center, which wrote on the same day that ‘America’s debt continues to grow on an unsustainable path.’ Both statements are wrong. To be sure, the dire budget future anticipated in the CBO projections could materialize. Large deficits could result from an economic calamity or war. Congress could abandon the principle that Social Security and Medicare Hospital Insurance should be financed within trust funds. It could enact other fiscally rash policies. But such deficits do not flow from current law or reflect the trust fund discipline endorsed by both parties over the last 80 years. And it is current law and policy that are supposed to underlie budget projections. Slashing spending because a thirty-year old law requires CBO to assume that Congress will do something it has shown no sign of doing—overturn decades of bipartisan prudence requiring that the major social insurance programs spend only money specifically earmarked for them, and not a penny more—would impose enormous hardship on vulnerable populations in the name of a fiscal fantasy. Editor’s Note: This post originally appeared in Fortune Magazine.